Sunday, we spent the entire day out and about in the neighborhood of Saint-Guillaume-le-Désert. It's a well-preserved, captivating (the French say séduisant) medieval village. Touristy, but that's France in the summer. Mainly French tourists, but we heard Spanish, Italian, and English. The centerpiece of the village is the Abbaye de Gellone. Founded in 806 by William de Gellone, a compatriot of Charlesmagne, the Abbey became a popular destination for pilgrims, prosperous, and a home for the arts. There's an excellent multimedia presentation at the Abbey's small museum which describes an ongoing process of laser-scanning the scattered pieces of the Abbey's cloister (many in New York City, Paris, Montpellier) and virtually reassembling the structure and its decorative stone work. Below is a fun inscription we saw in the museum. I don't read Latin at all. It's quite possible that the text isn't as jolly as the typography. This photo shows a trail that leaves the village, following a stream into a steep box canyon. 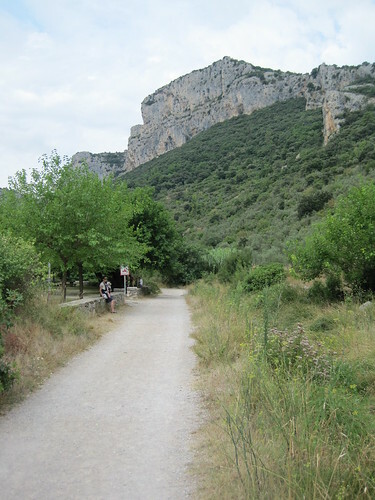 Below, there are olives groves, and higher, a research forest. At the the end there is a sequence of narrow waterfalls (dry, now) not unlike what you'd find in the Colorado Plateau, though in limestone instead of sandstone. If I'd had better shoes, I might have tried to scramble up the first one. Sadly, Google Earth's imagery for the region is low-res only. It's spectacular country. 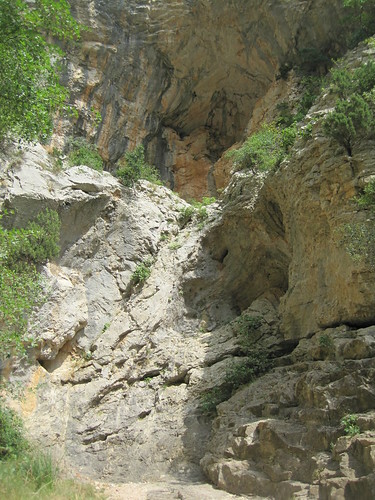 Below Saint-Guillaume-le-Désert are the gorges of L'Hérault, the end of which is spanned by an intact 11th century bridge (shown in images at the end of the French Wikipedia page). Below this bridge, there's an enormous swimming hole and a rocky beach used by hundreds of tourists. We didn't have our GPS with us, but I have added a few useful points of interest (my first) to OpenStreetMap using Potlach. We'll be returning off-season to do more hiking and fill in some more empty places on the map. Made me a bit homesick for the badlands of Utah, it did. The inscription reads "HIC IACET BLADALDUS PRESBITER QUI OBIIT III ID NOV". 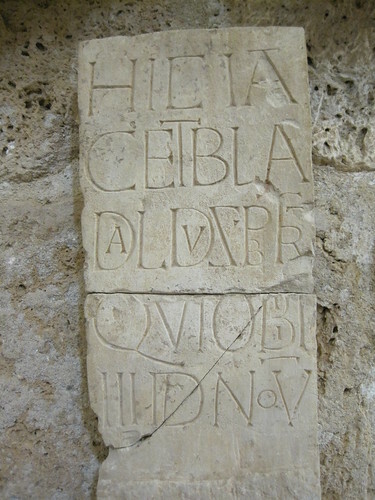 This translates to "Here lies the priest Bladaldus who died on November 11". So this was a grave stone. By the way, Géoportail has some higher-resolution aerial images from this region. See http://is.gd/2aAHK (with an overlay of the excellent IGN map). It's not as easy to navigate as Google Maps, but it offers good images and great maps. On the left hand side you can set the opacity of the map and the image. Thanks for yet another fascinating sightseeing advice. We are going to spend this year's summer vacation in this area of France, so your reports with photos, descriptions and map links are extremely interesting and valuable. Thanks, Clemens. Now I see that one can get above the dry fall by taking an earlier right branch of the trail :) There are at least 2 afternoons worth of hikes in this valley. And Grotte de Clamouse, which I'm also keen to see, is just down the road. When it's hot, a cave is the only thing that beats a swim in the river. Here's a tip for visiting in the high season: arrive in the village early. We were extremely lucky to find a parking space in the big lot Sunday at 10:00. Taking the shuttle bus from the big lot at Pont du Diable would be the next best option, I think. Look me up if you find yourself in Montpellier proper!